This Summer, We’re Going Dutch! I lovingly call her “The beast”. It’s big. Growing up, my grandparents had a caravan like the one in the photo in the Ardennes. 16 summers have I spent there, and I remember well all the friends I made on their campsite. We used to gather with the entire family and have big barbecues and go for long hikes in the endless surrounding woods. When I was 12, my parents bought a caravan of their own. A small one that could be hooked up with our car and for a year we traveled our tiny country, but eventually they settled on a campsite not too far from my grandparents. In Grand-Halleux I made friends for life, did morning gymnastics in the pool (even when it rained!) and spent hours and hours forgetting about the world on the immense playground. 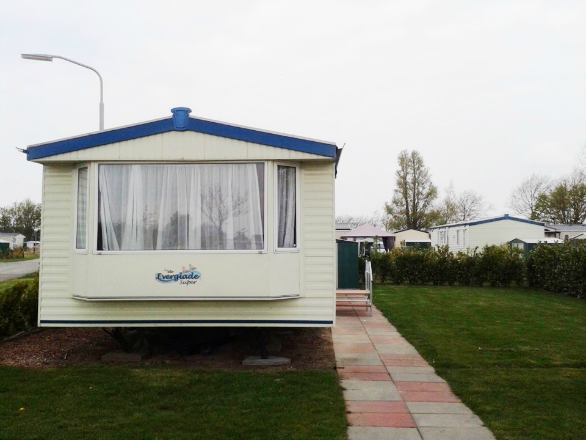 In April, we sold our old caravan because my parents bought the one you see in the photo above. Its location is closer to home and just across the border with The Netherlands. Its stands on a campsite in the cutest Dutch village I have ever visited and located close to a grand lake and the Dutch seaside. Even though I hadn’t been to our old campsite in 5 years, my heart felt heavy when I said goodbye to the Ardennes. It was as if I had to say goodbye to my childhood for real (which maybe isn’t a bad thing considering that I am 22…). The day my parents signed the sales agreement, my friends started making summer plans involving our new caravan. We might be going on a weekend in September, but since we all have a very busy school life or job planning such an outing tends to get complicated. If we’re friends on Instagram, you might have seen my snaps from two weeks ago when I was there with my mom, dad and youngest sister. The weather was just amazing, and I have got so many photos that I’d like to share! I got the idea to do a small travel series about my first summer in The Netherlands, and remembered the expression “go dutch” from watching Lost. The expression might have nothing to do with travelling, but I liked it too much not to use it as a tag for these posts. The first post is coming up next Thursday, I hope you will enjoy!